Updated to cover 2002-2017 here. 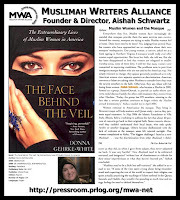 Aishah Schwartz (bibliography), an American Muslim revert to Islam since April 2002, is founder and director of the 2006 established Washington, D.C.-based Muslimah Writers Alliance (MWA) and a retired career litigation legal secretary. 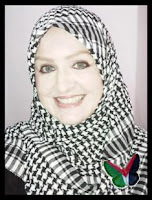 She is also a published freelance non-fiction writer/journalist and internationally renowned human rights activist with a focus on the rights of Muslim women and the plight of the Palestinian people affected by the Israeli imposed illegal embargo on Gaza. Ms. Schwartz's writing, primarily autobiographical, generally focuses on countering misconceptions about Islam and her own life as a Muslim. Relating her experiences as an American Muslim woman traveling in the Middle East, her stories gained world-wide notoriety via the internet. She eventually also became a featured writer for Naseeb Vibes, one of the world's largest online Muslim e-zines and social communities. 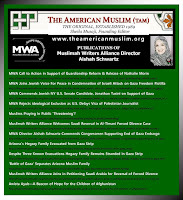 Ms. Schwartz's articles are also regularly published at The American Muslim (TAM) and various other outlets. Shortly after becoming Muslim, while volunteering at the 2003 ISNA Convention she was interviewed for Nile TV and later that year participated in a voter registration campaign at the National Press Club in Washington, DC, which led to her first "quote" in a CBS News story. As a writing activist Ms. Schwartz focuses on civil and human rights issues within the Muslim community at-large, particularly those adversely affecting Muslim women. 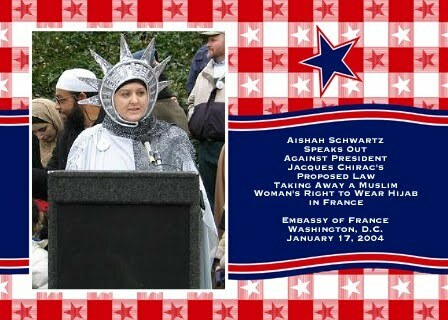 She addressed President Jacques Chirac, dressed as the Statue of Liberty, in front of the Embassy of France in Washington, D.C. as hundreds gathered on January 17, 2004 in protest of an impending law prohibiting Muslim women from wearing hijab. In 2004 Ms. Schwartz also participated in the live filming of the hour-long premiere episode of the WETA-TV series "Senso Reports" - Target Washington (2004); appearing twice in cameo. 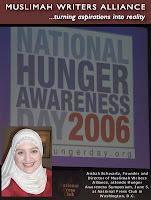 In 2005 she lead a national campaign in association with America's Second Harvest, organized to rally the Muslim community in support of National Hunger Awareness Day and developed a Hunger Awareness guide for participants in the Muslim community that was distributed to masjids across the United States. Robert Forney, President and CEO of America's Second Harvest stated, "We are honored to be aided in our National Hunger Awareness Day 2005 efforts by members of so many diverse faiths, including Ms. Schwartz." 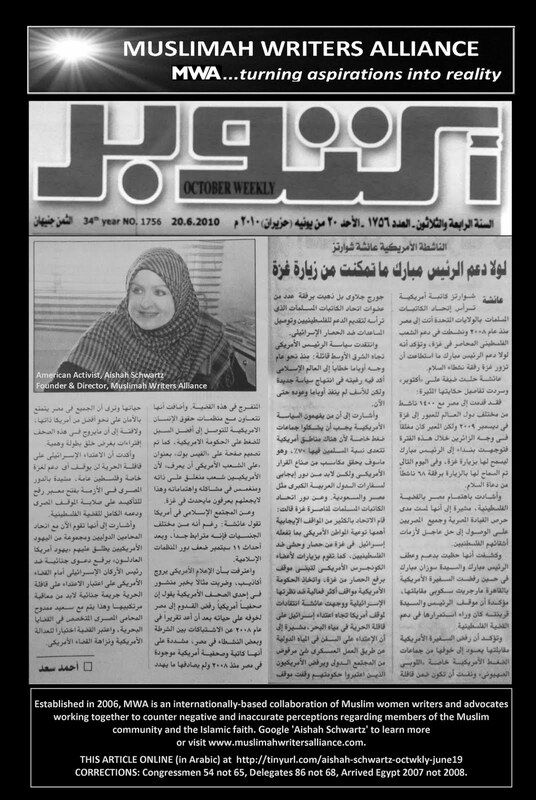 In 2006 she continued the Hunger Awareness campaign as Founder and Director of Muslimah Writers Alliance (MWA). 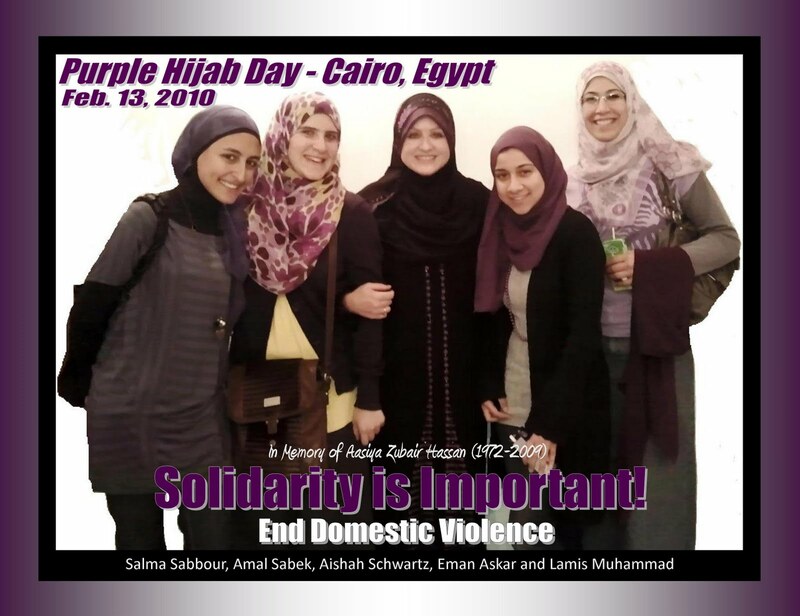 Through MWA her activism received international recognition in 2006 after a successful campaign to avert removal of a prayer space in view of the Kabba designated for women in the courtyard of Makkah's Grand Mosque. 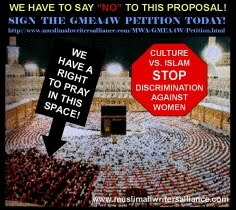 The impact the campaign website, online petition, poster declaring "We Have A Right to Pray in This Space! 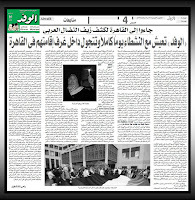 ", and press release, all directed to King Abdullah bin Abdul Aziz. 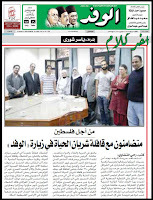 was reported on by Egypt's Al-Ahram Weekly. "Aishah Schwartz, founder-director of the Muslimah Writers Alliance in Washington, set up the Grand Mosque Equal Access for Women Project that circulated a petition protesting the restrictions [on women]. Very quickly over a thousand signatures were collected." Women inside Saudi Arabia and around the world, meanwhile, carried on protesting in the media. 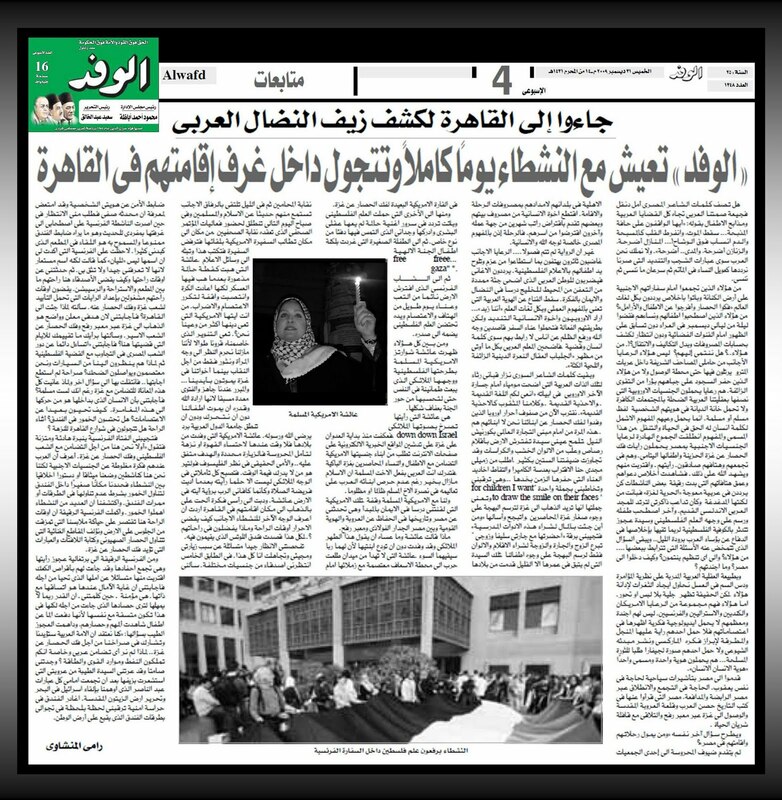 "It was the most striking example to date of concerted Islamic feminist global protest and one that authorities could not ignore," stated Margot Badran, Senior Fellow, Prince Alwaleed bin Talal Center for Muslim Christian Understanding, Georgetown University, Washington, D.C.
On September 11, 2006, the proposal was overturned based in part on pressure from international media outlets and response to the online petition endorsed by Muslims worldwide. 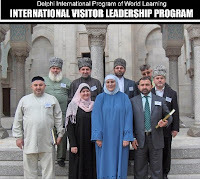 In July of 2007, in her capacity as Director of Muslimah Writers Alliance (MWA), and in conjunction with a program titled, "Islam in America; a project for Russia", Ms. Schwartz hosted a leadership delegation from Russia at the Islalmic Center in Washington, D.C. 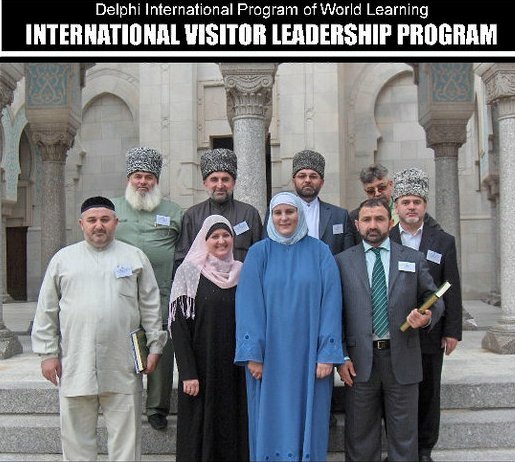 The program was part of the Delphi International Program of World Learning International Visitor Leadership Program, sponsored by the U.S. State Department. In 2008, Human Rights Watch (HRW) recognized Ms. Schwartz's work in support of equal rights for women in the Grand Mosque Equal Access campaign in its report titled, "Perpetual Minors". Ms. Schwartz was also recognized for her work in tackling equality within the masjid in the 2007 paperback release of Donna Gherke-White's 'Face Behind the Veil', a widely read collection of stories shedding additional light on issues facing American Muslim women. 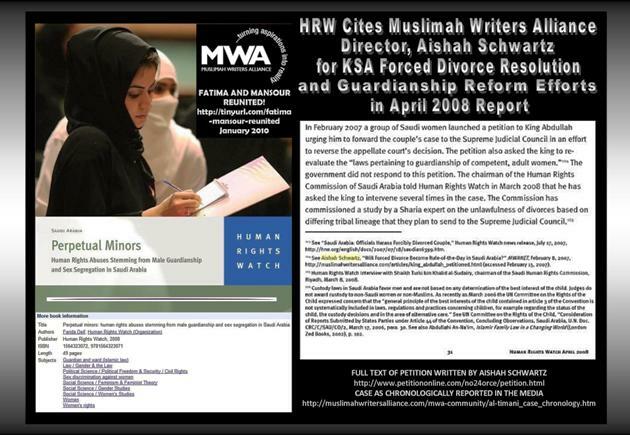 Launching another Saudi Arabia-based campaign in 2007, again directed to the Saudi King, Ms. Schwartz tackled the need for reforms in the Kingdom's laws regarding guardianship of women with the "Say 'No' to Forced Divorce, 'Yes' to Reforms" campaign, which combined the cause for reuniting Fatima and Mansour Al-Timani, a couple forcefully divorced due to alleged 'tribal' differences. Mansour Al-Timani and his wife, Fatima were finally reunited nearly 5-years from their divorce, however, the Say 'No' to Forced Divorce, 'Yes' to Reforms petition, signed by people from 40 Countries, 56 Foreign Cities, 21 U.S. States, and 45 U.S. Cities, continues in support of reform. Ms. Schwartz also had the opportunity discuss the issue as a guest panelist on the D.C.-based television program, "Islamic Perspectives". An unexpected surprise came to Ms. Schwartz in September of 2009 when her blog, "Sister Aishah's Islamic Journey" was recognized by The Daily Reviewer as one of the top 100 Muslim blogs. The Daily Reviewer selects only the world's top blogs (and RSS feeds), sifting through thousands of blogs daily to present the world's best writers. Blogs selected for inclusion are authoritative on their respective niche topics and are widely read. 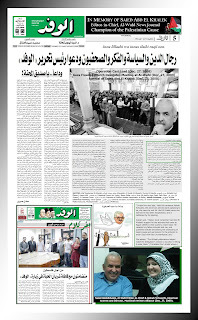 To be included in The Daily Reviewer is a mark of excellence. In 2010 Ms. Schwartz hit the ground running. On returning from Gaza in January 2010, she was compelled to do more. 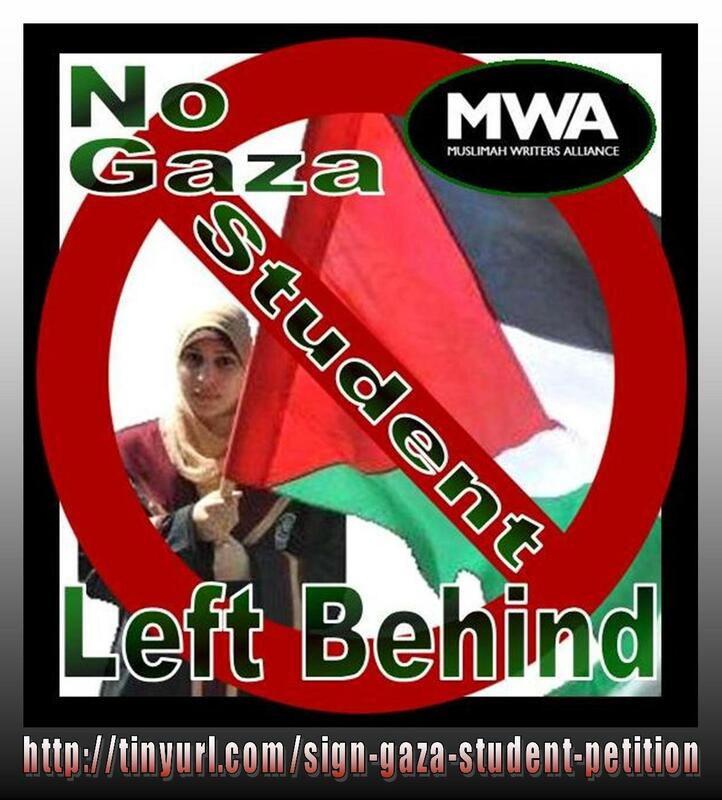 In support of the reported 700+ students in need of exit visas for pursuit of studies abroad, Ms. Schwartz launched the 'No Gaza Student Left Behind' campaign in June 2010 with a press release, open letter to President Obama, online petition drive and posters. 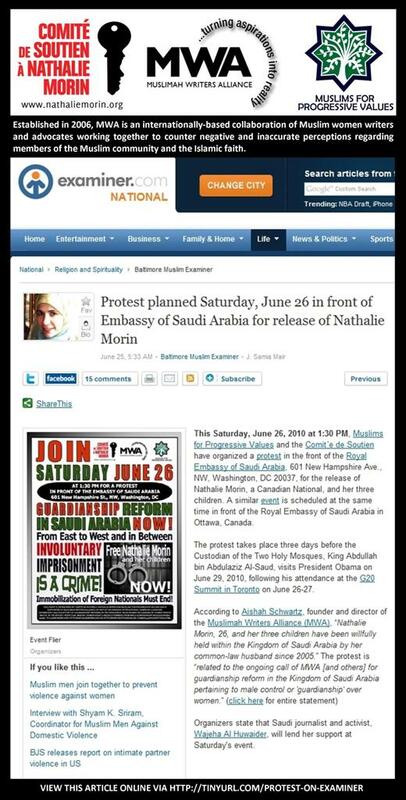 In June 2010 the woman's rights movement in Saudi Arabia resurfaced as guardianship reform, in conjunction with the rights of foreign nationals, once again came to the forefront as King Abdullah of prepared for a June 29 visit to the White House. 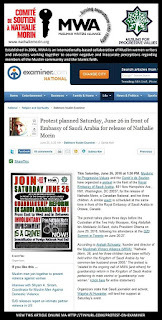 Ms. Schwartz again lent MWA's support, to demonstrations that took place in front of the Embassy of Saudi Arabia in Washington, D.C., and in front of the White House, in association with the Comit'e de Soutien 'a Nathalie Morin,' of Canada, Muslims for Progressive Values and Responsible for Equality, and Liberty (R.E.A.L. ), based in Washington, D.C.
"The women of Saudi Arabia continue in pursuit of much needed reform in the Kingdom's existing guardianship laws," stated Ms. Schwartz. "Many people confuse 'reform' with 'abolish'; the movement is not to dissolve guardianship, it is merely to improve the conditions of women suffering from uneven-handedness and to provide alternative recourse for those not benefiting from the protections that the law is intended to provide," Ms. Schwartz added. The new year was also marked by participation in International Hijab Awareness Day, an event organized in support of bringing awareness to physical abuse within Muslim communities - commemorated in conjunction with the one-year anniversary marking the tragic beheading of Aasyia Zubair Hassan (1972-2009). Taking her activism away from the keyboard in the summer of 2010, Ms. Schwartz participated in the the film production of a sequel to the Bridges Foundation project, "The Fog is Lifting", titled "Jihad Against Terrorism", also featuring Imam Suhaib Webb and others. 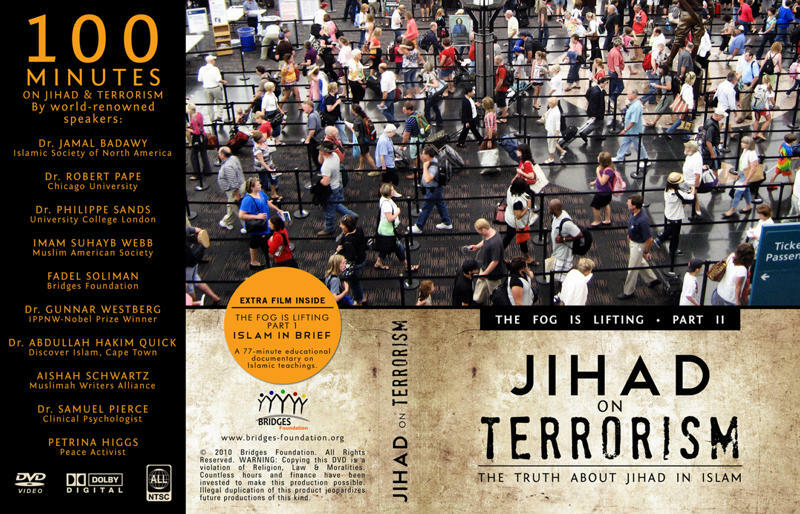 The DVD is scheduled for January 2011 release and should be available online at the Bridges Foundation website, insha'Allah. NEW! View DVD cover here! 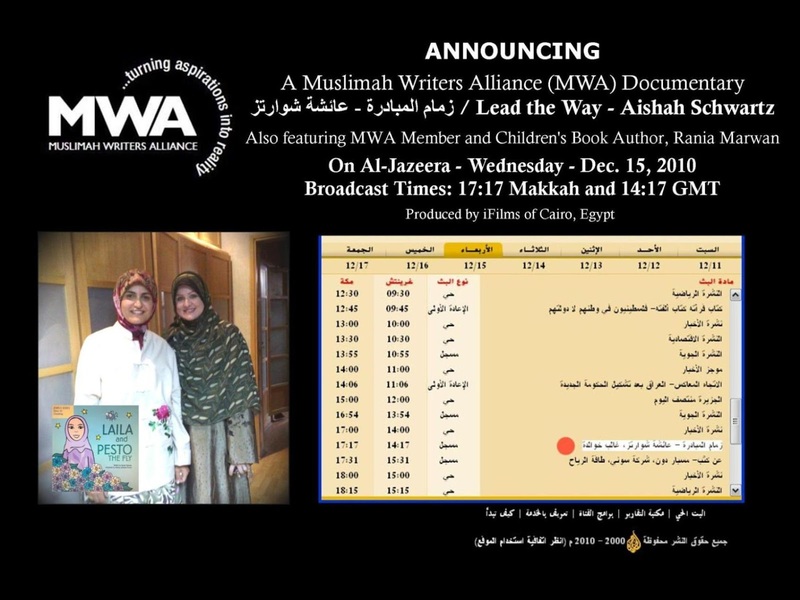 To round out the year, Ms. Schwartz was given the opportunity to showcase her organization, Muslimah Writers Alliance (MWA), through a mini-documentary titled, زمام المبادرة - عائشة شوارتز/Lead the Way - Aishah Schwartz. Produced by iFilms of Cairo, Egypt for Al-Jazeera Arabic TV, the documentary premiered December 1, 2010 (repeated on Wednesday's throughout the month) and is now available on YouTube. The short-film also features MWA member and new author, Rania Marwan, who recently published her first book in a series on Islamic manners for children, "Laila and Pesto the Fly". 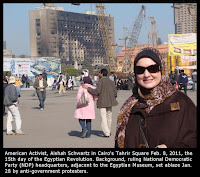 When the Egyptian Revolution broke out on 25 January 2011, Ms. Schwartz reported from her home in Egypt and visited Tahrir Square on 8 Feb. 2011 (photos). 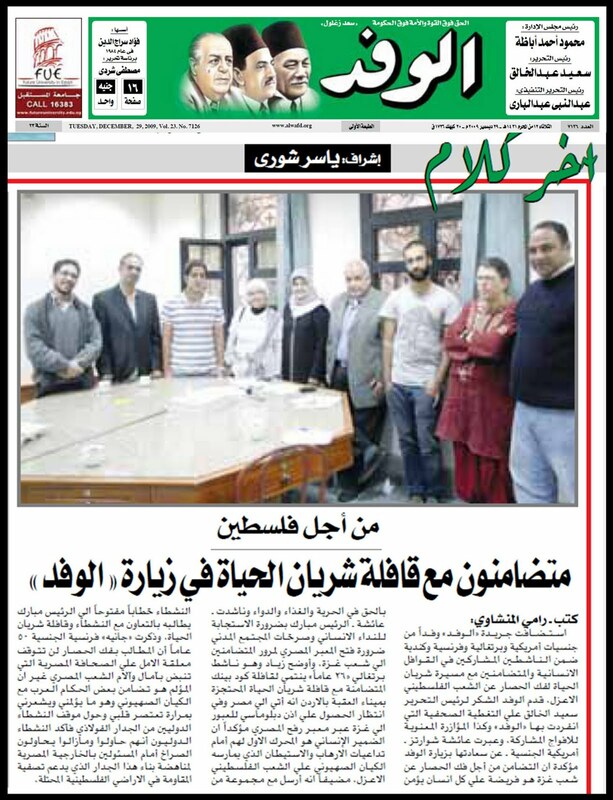 Cairo's Al-Wafd News Journal covered her visit. you have done a lot, to help Muslim community especially Muslim women and the rights violations against the Muslims around the world. keep it on Allah will surely reward in hereafter. (inshallah)because Allah is watching every body. MashaAllah my dear sister in Islam..alhamdulilleh youve taken on a great role for the reverts to follow inshaAllah..Im proud to know you ukhti. Ukhti Noor, thank you so much for your kind words. May Allah subhanahu wa ta'ala bless you and your family. Ameen. I just wanted to say, Jazakallah khair, for your time, effort and courage. May Allah(swt) reward you and give you health and emaan to continue, what you are doing. Ameen. as Allah bless u and save u. May your effort will be success and always, my sister Aishah. 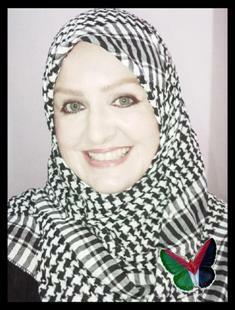 From Indonesia, my heart is always for all my brothers and sisters in Palestina. May Allah always protected you all. Masha´Allah! Your blog and your work is blessed! 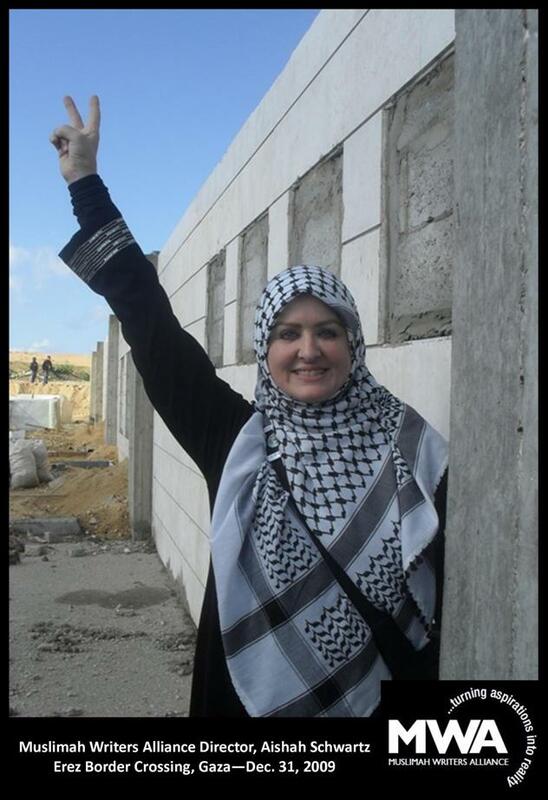 I love palestinian scarfs as you too. I am from Brazil and I would be proud to have your visit and your comment on my blog. reading your visit to a masjid I saw my own reaction pouring out of my mouth. I somehow find it amusing and irritating at the same time as how our Imam and Callers shout in the Mic even when listeners are within a small compound! Particularly, I have seen that Arabs are very enthusiast about shouting at their audiences. I do remember how My wife and I used to rush to our babies, when in sleep, the moment we sensed Azan is about to be delivered. I personally feel that living in the vicinity of a masjid is a harrowing experience in any muslim country. If there are 5 Masajid within a block, each will shout at top of its voice! Instead of having a soothing effect, it creates a terror and in Ramadhan it causes extreme inconvenience to neighbors. 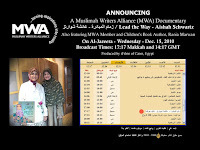 I am honoured being a member of MWA sister Aishah! It's a pleasure to know you. Barak Allahu fi ilmik wa fi amalik wa fi nafsik aameen. tears dropped from my eyes as I was reading your story (I was forced to accept Islam) god loves you sister.